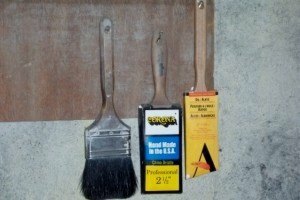 In Best paint brush for furniture painting, Adam Bermingham Traditional painter in Ireland introduces us to the paint brushes he uses and recommends in the course of his work hand painting furniture in Roscommon. Recently on my Facebook page and other platforms, interested followers, both trade and D.I.Y enthusiasts, have been asking various questions on the subject of paint brushes for painting furniture, and Paint Brush Cleaning. So in this article I will attempt to give you all a comprehensive overview of the brushes I use. Later I will share what I use to clean them. Decorating is one of the things that most homeowners have attempted themselves at some stage. They may do some DIY every year, so if you could buy high quality equipment once and keep it in good condition for years, which is possible, you can save yourself a fortune. Most people, however, when taking on a project at home would go out and buy new equipment every time, but I don’t believe this to be cost effective. The first section contains the Woosters. I use these for the majority of the painting I do. I use mostly Crown Liquid Satin and Eggshell. The finish achieved with these brushes is second to none in my opinion. I’ve been using Alpha’s for a while now, but as you can see I’ve just got a new FTP and this may be even better, I’ve not made my mind up yet. 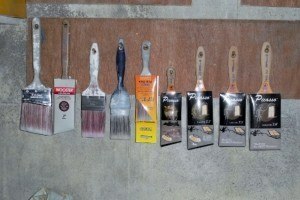 This is a selection of brushes that I use for non-standard work like Zinsser B-I-N primer, a shellac based primer used on glossy surfaces. It leaves brushes in a less than perfect condition, so I don’t like to use expensive, high quality brushes. 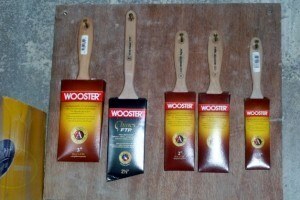 Also here is Wooster Ultra/Pro that I use for heavy bodied varnishes. Next to these are the Proform Picassos. I do all my priming with these in both water based Zinsser Bullseye and Oil based Zinsser Coverstain. They are very easy to use and the high amount of product they hold is great for priming. 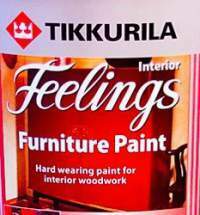 I sometimes use them in heavy bodied topcoats like Dulux Trade Eggshell. 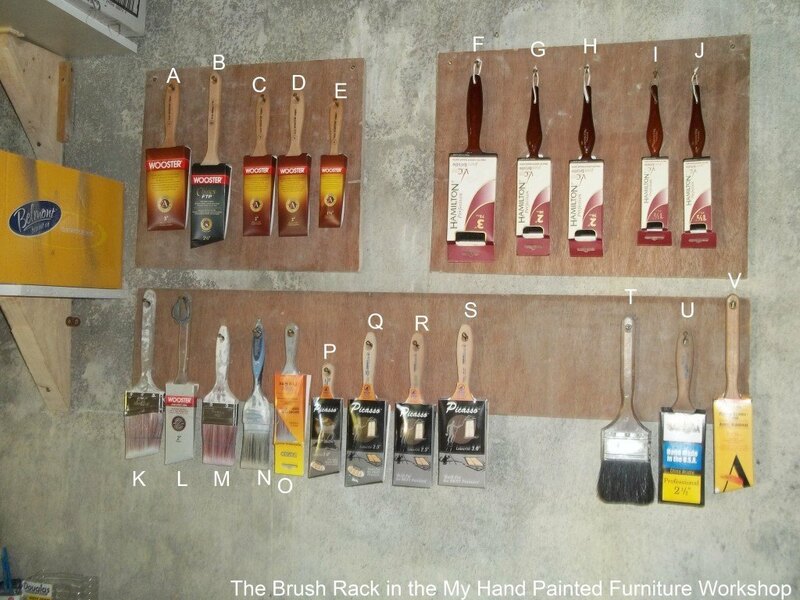 On the right hand side of the rack are all the different sizes of pure bristle brushes. 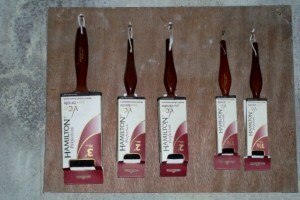 Hamilton Perfections, I use these in Sadolin Classic Wood-stain, my go-to stain in the workshop. Of the following three, I also like the Corona Morro for staining large areas. The Purdy I recently picked up at a boot-sale for €1 and I hope to bring it back to life with some brush reviver, I will let you know how that goes in a later “In the Workshop” post. Lastly is an Allpro that I was given for product testing by a local store and I use that for clear varnishes. It doesn’t hold its shape very well, but I like the finish so for large flat areas it’s great. Well, that’s a list of the brushes I use every day for Hand Painted Furniture, I hope this will be a help to you all when selecting a brush for yourself. A good all-rounder if you want one brush to do you for most projects would be a Wooster Alpha or FTP, either 2 or 2.5 inch. As a caveat to Irish readers, whilst every hardware store here has a large selection of paint brushes, most do not stock the high quality, professional paint brushes that I would recommend to everybody in the trade or DIY sector. I buy online from My Paint Brush who are recommended suppliers on Traditional Painter, and Plush Brush Company. 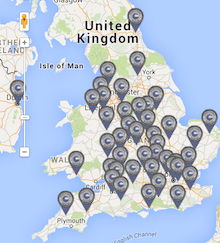 Specialist painter and decorator, Adam Bermingham, is a mber of the Traditional Painter UK network. He is the first port of call for hand painted furniture and kitchens Ireland. Joseph & Son is Adam & Tom Bermingham, a father & son team with diverse backgrounds covering specialist painting and decorating, antiques and interior design. We are also launching a new brush called the Wooster Paint Pro, a round sash brush with the same filament formulation as the UltraPro Firm. Wooster Peint Pro Brushes will be launched at the Coventry Show 20th and 21st November at the Ricoh Centre – visit our stand! Wooster not letting the grass grow. Good to see. i love the pure bristle brushes since the natural bristle can be used on any kinds of paint. I suggest the information for the difference between the exterior paint and interior paint. Read this article to know more.